I purchased an Xbox 360 late in 2008, and one of the very first games I played was BioShock. I was smitten right away. Crashing in the middle of the Atlantic Ocean and discovering the idealistic world of Rapture hidden underwater was unlike anything I had ever experienced. Critics and gamers alike had similar reactions, and its success meant a sequel was inevitable. 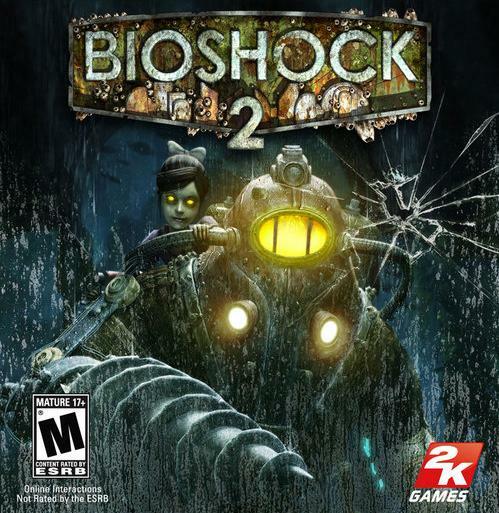 Despite BioShock 2 (BS2) being released in 2010, I never got the chance to play it until recently (largely thanks to Microsoft putting this on sale for $10 last week). As soon as I began my BS2 campaign, a flood of memories came rushing back. I didn’t realize how much I missed Rapture and its bizarre 1960s setting. Even though it had been years since I last entered this underwater dystopia, it felt like I never left. Everything was so familiar. Set eight years after the end of BioShock, this time around you get to play as a Big Daddy, the large (and dangerous) protectors of Little Sisters. I was initially apprehensive about being able to play as one of the most-feared enemies from the first game, but my worries were quickly put to rest. The Big Daddy isn’t overpowered at all, and he has access to the same weaponry and plasmids as the previous protagonist. Basically, everything you know and love from the first game is back again. 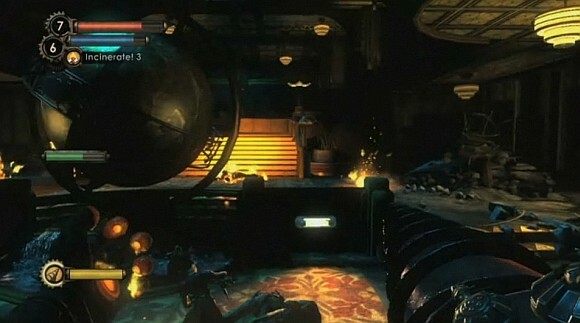 The haunting atmosphere, the ability to harvest/rescue Little Sisters, the frenzied enemy “splicers”, the copious plasmids (including access to the Big Daddy’s drill) and gene tonic power-ups. Looting corpses and safes for ammo, cash and ADAM (the game’s version of XP) is still commonplace. It’s all there. 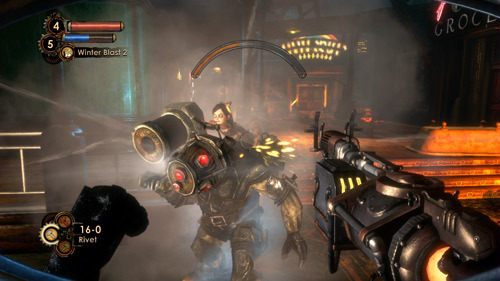 Being more of the same is a double-edged sword with BioShock 2. Part of what made the original so alluring was the sense of discovery — Rapture was a new and exciting place with so much to see. Now that we are familiar with the locale, it has lost a bit of its “wow” factor. More could have been done to expand upon the first game. At the same time, it’s great to return to such a unique world and play through the perspective of a different character. Undoubtedly the biggest difference between the two games doesn’t come from the single player campaign, but rather the addition of a new multiplayer mode. Much like playing the role of a Big Daddy, I was skeptical of this inclusion. 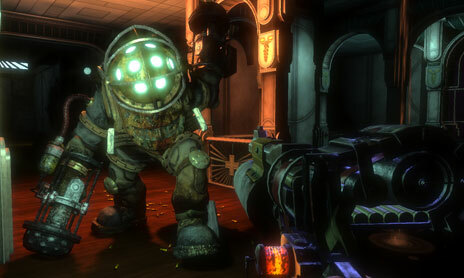 BioShock was a tremendous single player experience — was multiplayer really necessary? The answer is still no, but the multiplayer is surprisingly well-executed. This mode is tied in wonderfully with the game’s universe, and it offers a fun diversion from the main content. It’s pretty basic stuff — the XP system gives access to new plasmids, weapons, etc. as you progress — but the addition of random Big Daddy suits during matches adds an interesting element to the gameplay. The online feature isn’t a particularly deep mode but it does complement the campaign quite nicely. Between the two modes, I put in a good 15 hours into BioShock 2, and I quite enjoyed my time with the game overall. Sure, it’s more of the same, but there really isn’t anything like the world of Rapture. I will be happy to come back once again for next year’s BioShock Infinite. I love both of the Bioshock games! I cannot wait for the new one to come out. I would love to try the original System Shock games, but unfortunately even if I had the opportunity I wouldn’t be able to get the chance to. I’ve been curious about the System Shock games, too. Wonder if they hold up well at all. I totally understand where you’re coming from, Nostra, but playing as the Big Daddy actually works out quite well in the sequel. This game’s going for dirt cheap these days and is definitely worth looking into, especially if its been a while since you played the first one. I really enjoyed Boishock 2, and liked the twist of plaing the game as a Big Daddy this time around. The underwater setting was as brilliant as the first game, the story was also very good, and the gameplay was very rewarding. A great game, your review makes me want to play it again! Thanks Paul, glad to hear you dug it as much as I did! I still have the Minerva’s Den and Protector Trials DLC waiting, which I can’t wait to play. I was pleasantly surprised by the multiplayer – definitely not needed but it worked pretty well and there were quite a few people playing it at the time. Good review! Thanks, man. I was able to find plenty of people online during the last week as well, so there appears to still be a community. Of course, a good portion of that could have been due to the XBLA sale, but I never had trouble finding a game. Loved the first one but never got around to finishing this one. Probably need to do that some day soon. I am looking forward to Infinite though. Great review! Thanks, Gary. I wasn’t terribly hyped about Infinite earlier this year, but now I’m pretty excited. It’s looking great.